The Online College Student - Lazy? Most colleges and universities provide their students with opportunities to take courses online. Unfortunately, online classes still suffer a bad reputation due to many myths that simply don't hold water. I went to see the movie Lincoln last weekend. I’m looking forward to seeing it again…and again. 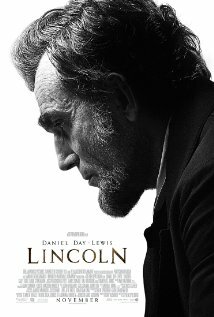 The movie covers the time period from January, 1865 to April 9 at the end of the war and five days later when President Lincoln was assassinated. Spielberg had already begun to develop the idea of a movie concerning Lincoln, but after attending a luncheon for historians where he met and spoke with Doris Kerns Goodwin he decided to base his project on her book, Team of Rivals, however, the scope of the book…..the scope of Lincoln’s presidency is too large and complex a subject to digest into a movie format. Spielberg had to decide what to focus on, and I’m pleased he decided to focus on the struggle to end the war and most importantly the wheeling and dealing that was necessary to get the 13th amendment passed. Here are 13 little tidbits regarding the movie…. 1.Spielberg and his team spent over twelve years researching the movie. The attention to detail far outweighs other discrepancies here and there, even though those very discrepancies are the subject of this post. One detail that amazes me happens to be the watch sounds you hear in the movie…tick, tick, tick. The sound is from Lincoln’s actual pocket watch he was wearing the night of the assassination. The watch is on display at the Kentucky Historical Society in Frankfurt, Kentucky. Spielburg recorded the watch sounds and incorporated them into the movie. 2. Other "real" sounds that Lincoln would have heard were used as well. Lincoln often visited St. John's Episcopal Church after reading the war reports at the telegraph office. He would slip into the church if services were underway and slip out again before the members of the congregation would know the President of the United States had been there. Spielberg's team recorded the actual sounds of the St. John's steeple bell as well as the creaking of Lincoln's pew and the floorboards he would have stepped on. 3. There are no historical indications at all that Mary Todd Lincoln ever attended any sessions of Congress including the House debates or votes concerning the 13th Amendment though the movie indicates her attendance. This is purely for dramatic flair…. I don’t have a problem with it, but in 1865 it simply wasn’t done. 4. While the debate and voting scenes did take place in the old House chambers at the U.S. Capitol, voting would not have taken place called by state delegations. It would have been done alphabetically. 5.Also, many of the representatives who voted “NO” on the 13th Amendment are not identified in the movie correctly. As with any congressional vote there are many reasons why a member votes for or against a measure, but Spielberg decided to change the names for fear the men’s families would be embarrassed or suffer undue attention. I’m not sure how I feel about that…. 6. At one instance President Lincoln mentions something about signing the 13th Amendment. That wouldn’t have……shouldn’t have been done. Resolutions are not turned into amendments by the signature of the President. They are passed by both houses of Congress and then ratified by the states. President Lincoln’s signature was NOT needed……..however, in a quirky move he DID. President Lincoln did sign the 13tth Amendment! 7.In a few scenes the Executive Mansion is referred to as the White House. This was not in vogue during Lincoln’s administration, and would not have happened. In Lincoln’s day the “people’s house” would have been referred to as the Executive Mansion or The Mansion. 8.During the brief scene at Appomattox General U.S. Grant is shown very clean however, according to the late historian Shelby Foote (loved that man!) in Ken Burn’s Civil War series Grant attended the formal surrender wearing the overcoat of a private and was very muddy. 9.At some point the political operatives Lincoln hired to help sway votes in favor of the 13th amendment mention to the President they are having problems paying people off since the coins they are using have Lincoln’s likeness on them. These coins did not exist during the fight to push the 13th amendment through. They didn’t exist until four years after Lincoln’s assassination, and of course, it was the penny, not a fifty cent piece as mentioned in the movie. 10.Thankfully the last scenes of Lincoln do not go into great depth regarding the Lincoln assassination. Thankfully….because most Americans are familiar with the events and Spielberg wanted to hit on portions of Lincoln’s administration that viewers might not know as much about. What was included was a scene after Lincoln had been removed from Ford’s Theater and taken across the street to the Peterson house. What the scene portrays, however, is a little inaccurate. Rather than laying in the fetal position as he passed away fully clothed Lincoln was placed on the bed diagonally as the bed couldn’t support his tall frame any other way. Lincoln was also naked under the covers as his clothes were removed so that he could be examined for other possible wounds. 12. While many historians have been critical of the voice for Lincoln Daniel Day-Lewis developed for his portrayal of Lincoln, Spielberg apparently approved of it. I liked it…. It is said when Day-Lewis developed a voice he liked he made an audiotape of it and sent it to Spielberg in a box labeled with a skull and cross bones meaning for Spielberg’s eyes only. 13.Finally, many critics and friends have stated to me that Daniel Day-Lewis should win the Academy Award for his performance as President Lincoln. I agree. He was fantastic, however, did you know he wasn’t the first choice to portray Lincoln? Yes…..Liam Neeson was involved in discussions regarding the part, but finally bowed out because he felt he too old. Did Lincoln Make a Deal With God? You can find some other interesting bits of information about the 13th Amendment here. 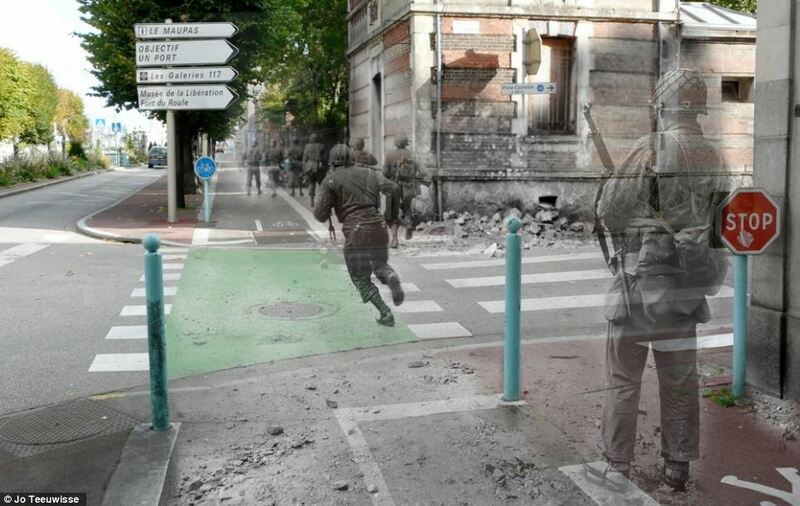 Yes, you see soldiers proceeding up a street, but notice that you are actually looking at two images…..one from World War II and another from more contemporary times of the same location. Think about the impact this could have on students of history. Think about the connections that students could make between historical content and their surroundings. These pictures are the work of historical expert Jo Teeuwisse from Amsterdam. This article from the Daily Mail states she began superimposing images from different time periods of the same location after finding 300 old negatives at a flea market in her home city depicting familiar places in a very different context. Teeuwisse’s work isn’t just as simple as layering photographs, however. She researches daily life before and during the war, interviews eye witnesses when she can and recreates certain aspects of history to gain a unique insight into that area. Isn’t that something than any history teacher worth a grain of salt wants to do with their students? Of course…..part of our job description is to help students gain unique insight into the historical content we present to them. Click through to see the pictures presented with the Daily Mail article. Also visit the Ghosts of History Flicker page and the Facebook page here. 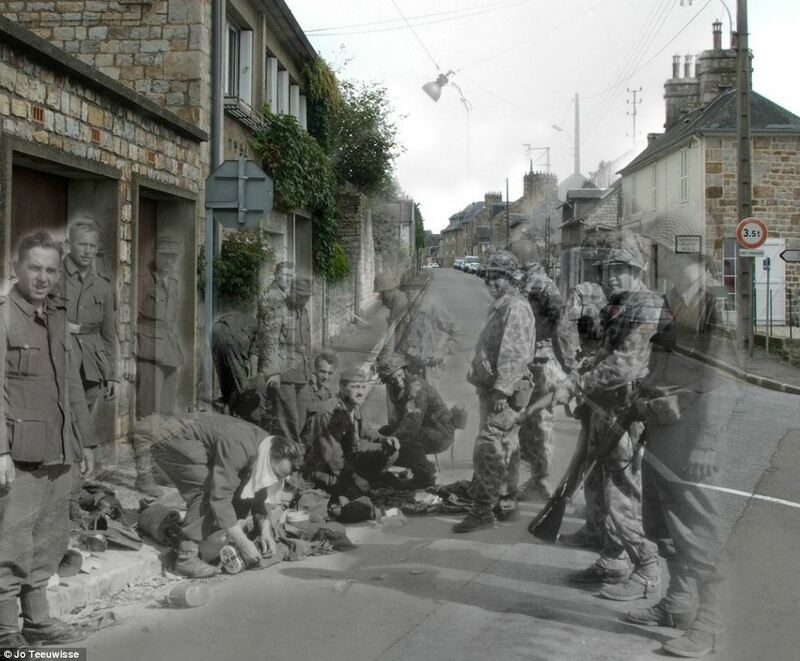 I’m thinking the process of superimposing images from various historical times …..The Civil War, Civil Rights and not just World War II would be a valid project for students with a little planning and guidance.